Businesses that have already surfaced to the cloud are aware of the massive efficiencies they are able to reap using web and mobile applications leveraging the latest digital hybrid technology hardware interfaces. 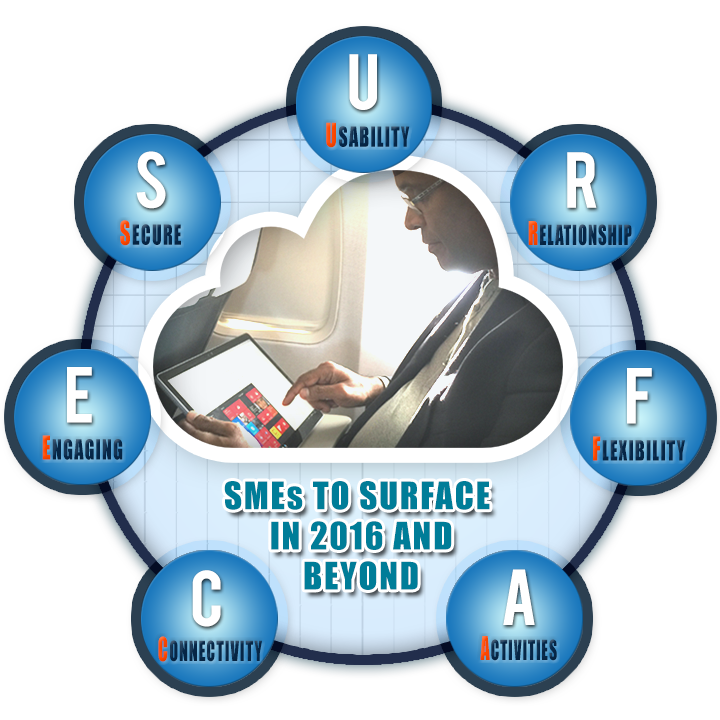 With the growing need for Small to Medium Enterprise Businesses (SMEs) to become more productive and versatile, there has never been a more perfect time to embrace cloud, excel in your passion and make your business SURFACE as a leader in your niche. If you have read any of my previous articles, you probably know where I am heading to! Yes, you guessed it! 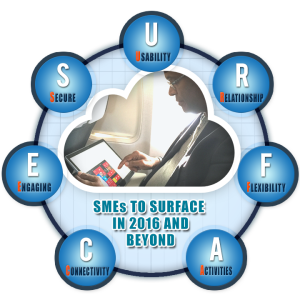 I will be using SURFACE as an acronym to explain why a hybrid device and a cloud interface can push your SME business through the ladder of success? In an era where malware, cyber-attacks and hacking is a growing concern for businesses and customers alike, is security of your enterprise data on top of your priority list? Loss of data or breach of confidential information could cost businesses to even go bankrupt. If you think data security is an issue for only larger enterprises to worry about, think again! Given the fact that very few small businesses realise the risk of data breach and thus are woefully unprepared, SMEs are quickly becoming the favourite target of digital attackers. Nonetheless, it’s important to note that not all cloud based platforms are secure. To protect your vital business data and keep customer trust in your service intact, make sure you are dealing with a secure cloud hosting service providers and using secure solutions provided by reputable organisations such as Microsoft and others, which are continuously improving their platforms to secure your data on the cloud. Equally important is your personal hardware that you use to access your cloud data – ensure it is well protected from unauthorised access using encryption and personal finger and face recognition technologies. That’s exactly what AssistRx did! By moving to Microsoft Surface Pro, the US based firm was able to eliminate the need of two or three devices per employee, multi-task through the day and enhance security of vital business information. Refer to the case study below. A US Case Study in Review: AssistRx standardises use of portable devices to enhance security and boost productivity. In late 2013, AssistRx, a US based technology solutions firm decided to replace its mixed IT environment with a single solution provider for greater consistency and security. It turned to Microsoft, making Surface Pro the only device all its mobile employees used. 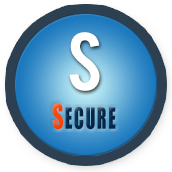 Additionally, by standardising the use of Microsoft software, hardware and cloud service, such as SharePointOnline, OneDrive for Business and OneNote, AssistRX was able to keep all documents within the Microsoft network and strengthen enterprise security. “Windows 8.1, the Surface Pro 3 and Microsoft applications are a very secure combination,” says John Prescott, Director of IT at AssistRx. From home to office to cafes, businesses crave productivity at every step of the way. However, with different devices offering different functionality and no single one offering it all, employees are often stuck due to the constraint of time, space and so many devices (desktop, tablet and smartphone) to deal with at the same time. However, with a hybrid device that combines the functionality of a laptop and a tablet, businesses can enjoy the best of both worlds. A meticulous blend offering convenience of a tablet and productivity of a laptop, the future undoubtedly belongs to highly functional hybrid devices that connects seamlessly via a secure cloud based network. For the same reason, I have now switched to Microsoft Surface Pro as you can see from the pictures below and loving it! Refer to the case study below on how students and teachers at East Berkshire College were able to improve engagement and facilitate better learning by adopting Microsoft Surface Pro as part of their technology overhaul. A US Case Study in Review – East Berkshire College deploys new hardware technology for better learning experience! With the aim to improve on quality technology resources East Berkshire College wanted to give its teachers and students flexibility and versatility to work effectively outside the classroom. The college decided to deploy Surface Pro! By combining portability and compactness of a tablet and functionality of a laptop, Surface Pro seamlessly integrated into their existing routines. Additionally, by incorporating Microsoft OneDrive as part of the Surface deployment, East Berkshire was able to make accessibility to resources available to all, anywhere, anytime! 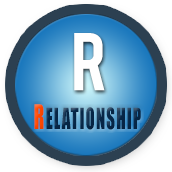 The tools you use to interact with your customers and partners are just as important as how you deal with them. An uninformed customer service representative, delay in taking corrective action and problem connecting with your office, could all mean literally pushing your customers and other stakeholders to your competitors. Effective and efficient communication are the keys to a positive customer experience. The cloud ensures your employees are not only always available but also able to access on-demand customer and supplier data to timely respond to queries and service requests. Hence, better collaboration on the cloud with your employees, customers, partners and suppliers means better relationships. Microsoft’s recent purchase of LinkedIn is an example of how leading brands are valuing the importance of Social Selling in a collaborative manner to strengthen the relationship(s)! Another case study example below is from WashClub, a high-tech cleaner that was able to secure customer information, remotely access files and increase customer experience via Microsoft Surface Pro using Windows 10. A US Case Study in Review: High-tech cleaner simplifies customer experience with Surface Pro and Windows 10! WashClub, a US based high-tech garment clear understood the role technology plays in keeping customers happy. To make its business more efficient and deliver better customer experience, WashClub adopted Microsoft Surface Pro with Windows 10. For many years, WashClub had been using DocuSign service to digitise employee and customer forms and signatures. With the pen experience of Surface Pro and Windows 10, DocuSign became a more natural way to speed transactions and boosting customer confidence. The increased efficiency with Surface Pro allowed Wash Club customers to focus more on clients during business hours and beyond! Being on the cloud allows businesses to become more flexible in terms of accessing data from any place, any time. The best gets even better as you manage work related queries and respond to business related social media conversations using a single platform to handle real time data. That’s not all! You can switch from work mode to personal mode in no time. A great example of this could be my Microsoft Surface that uses Windows 10 offering interface consistency and allowing me to utilise the virtual desktop functionality to swap between an office work desktop to a private one as when I require. Thus, the level of agility a hybrid device like the Surface laptop integrated with cloud services can help companies gain a real advantage over competitors, while allowing employees the work and private life balance! Again refer to a case study below on how a fleet management company was able to increase sales productivity and improved story-telling with the flexibility offered by Microsoft Surface Pro. A US Case Study In Review: Fleet Management Company increases salesforce effectiveness with technologically advanced hardware! Enterprise Fleet Management wanted to step-up its technology with portable, powerful devices for its employees. It choose to deploy a device that would fit into its existing Windows landscape.The natural answer was Microsoft Surface Pro! This sleek portable device allowed its salespeople to deliver high impact presentations using touch screen and an amazing reading interface! “They can hand the Surface to a customer and let him or her get a close-up look at our offering”, says Tom Chelew Senior Vice President Sales and Marketing. “Or they can use MiraCase to connect to projector if there are multiple people in the room”. Time is money! Yet, in today’s fast paced world, its often a resource that business people are running low on. There has never been a more pressing need for a solution that could make working, collaborating, brainstorming, accessing information, fuelling new ideas and implementation faster. Consumers, particularly the millennials demand information fast. As a result, more and more innovative and disruptive solutions, like Uber and AirBnB have emerged that seek to simplify the lives of consumers with all the information just a tap away. Similarly,a cloud based platform run on a compatible technology infrastructure attempts to accelerate business activities and makes accessing information a breeze. Software solutions like Microsoft OneDrive and Microsoft OneNote, brings all business activities and information on any device you want making our daily work activities a lot simpler and faster. Read through the Case Study below to understand how swapping old devices with Microsoft Surface Pro, Wakefield Canada, a motor oil distributer was able to boost their salesforce effectiveness and efficiency in the field by multiple folds. A Canadian Case Study in Review: Motor Oil Distributor choose one tablet to serve its salesforce diverse needs! Wakefield Canada, a leading motor oil distributor was in search of a more interactive way to tell brand stories to their potential clients.To better mobilise its Salesforce, Wakefield replaced the heavy laptops with lightweight tablets that would help them perform all activities with ease. Wakefield decided to give Microsoft Surface Pro a go and was amazed with the results. For any SME that relies on connectivity to run their business, losing a single work hour to bad internet could mean delay in customer service, halt in daily activities and a possible bad word of mouth from frustrated customers. 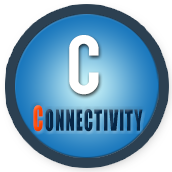 A good internet connection is a must in order to create a culture of openness and innovation. Being connected means that your business can take your customers on board with real time video streaming, help them choose products from your website, timely respond to customer feedback, circulate time sensitive information and share ideas internally or externally. But a business does not just need to connect with its customers. The success of today’s SMBs lies in their ability to connect with all stakeholders through multiple channels and across a range of devices. While cloud software platforms, hosting and flexible hardware like the Microsoft Surface has emerged, sadly some remote suburbs and regional areas in Australia still suffer from internet access. I sincerely hope that Australian Federal and State Governments and Telecommunication authorities address these soon for all Australian SMBs move forward and be competitive with the rest of the world! Learn how this Australian based organisation Sapphire Group experienced a productivity boost with new computers and cloud services resulting in decreased costs and time savings. An Australian Case Study in Review: Fragrance manufacturer adopts new technology to gain competitive edge! Sapphire Group, a leading manufacturer of fragrance products across Australia was struggling with its inconsistent IT structure and patchy connectivity in remote locations. It needed a solution that would allow faster remote access to company systems, save time and boost productivity. Moving to Microsoft software, hardware and cloud services allowed remote employees to skip the arduous login process with connectivity that was 10 times faster than it was before. “The ability of employees to stay in touch with one another and with suppliers through email and instant messages even when out of the office has been a really great improvement for us,” says Paul Hoad, Chief Financial Officer at Sapphire Group. As businesses increasingly rely on their customer experience management system (CXMs) the importance of timely engaging with your audience cannot be over-emphasised. Siloed marketing, sales and service interactions results in frustrating customer experience and unfulfilled expectations from each department. However, a cloud based CXM system brings all business departments on the same page increasing customer engagement in terms of reach, acquisition, retention and loyalty. Note: This is my next article subject, which will be released in the next few weeks. Furthermore, as more disruptive cloud based solutions such as Uber, AirBnB, NetFlix and others become a norm for other industries, timely engagement with the right information and context about our business contacts is vital for business success! The case study below demonstrates how a US based company Westgate Resorts was able to make their sales process far more effective and enrich their customer experience by replacing their paper-based marketing efforts with a Windows based digital solution. A US Case Study In Review: Resort company improves customer engagement with innovative digital solutions! Westgate Resorts that sells vacation membership contacts wanted to replace its paper-heavy mortgage closing process with an innovative digital solution. It turned to a Windows based application running on Microsoft Surface tablet. Instead of its usual leather-bound portfolio full of printed marketing collateral, Westgate was now able to hand the buyers their tablet preloaded with a custom app featuring their services. Users would use the tablet to manage their resort ownership, browse the catalogue and learn more about the services. The company also used Microsoft cloud platform, Azure, to push notifications about special events and packages on buyer’s tablets. That’s not all, Westgate was also able to capture user’s interaction patterns with the app and analyse data for marketing. As noted earlier, despite some short coming in moving to cloud based technologies, the hybrid devices and cloud platforms are the future of Small to Medium Businesses that seek to boost productivity and take their businesses to the next level! SMBs that resist making a switch towards these technologies may find themselves lagging behind or the competition may edge them out of the business altogether! I have been able to launch my SMB to the next level with upgraded Security, better Usability, value-added Relationships, enhanced Flexibility, insightful Activities, uninterrupted Connectivity and meaningful Engagement, using Microsoft Surface hardware and software and also relying on leading cloud hosting providers and internet service provider companies!